Rufaro Murenza was nominated for a fourth consecutive year as a finalist in the National Arts Merit Awards (NAMA) in 2017! 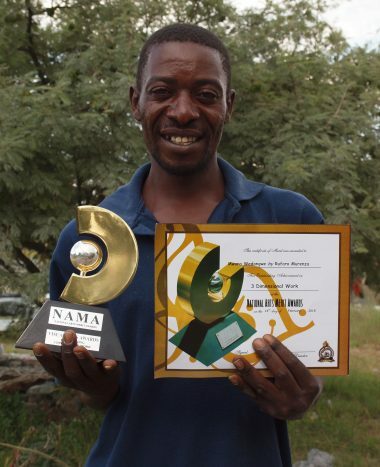 Rufaro was a deserving winner of the 3D sculpture category of the 2015 NAMA awards. He was also a NAMA finalist in 2016 and 2014. Rufaro was born in Zimbabwe in 1980. While doing his ‘O’ levels, he started working with world famous Zimbabwean sculptor Joe Mutasa, as his assistant at Chapungu Sculpture Park in Msasa, Harare. At Chapungu, he was exposed to the works of many artists, like Tapfuma Gutsa, Nicholas Mukomberanwa and Eddie Masaya who had even ventured into granite carving. In 1998, Rufaro and Joe attended a workshop in granite carving at Chapungu with Joram Mariga and two visiting Japanese sculptors. From then on, he never looked back. Rufaro went to Belgium in 1998 for an exhibition with his mentor Joe Mutasa. It was highly successful and resulted in the sale of all their pieces and also secured many orders. After many years with Joe, Rufaro felt the time had come to strike out on his own and has since experienced great success including four consecutive years of recognition at NAMA. This text is copyright (please see statement on our homepage) and is the intellectual property of Guruve Ltd and must not be reproduced without our permission and attribution to www.guruve.com.